It occurred to me that I haven't talked about Mr. One's Tween room in a while. So I thought I'd give you all a little update today. As you may remember, I had some grand plans before my budget for his room was suddenly gone. So I made do with what I had already purchased. One of the things we were lucky enough to have purchased before our budget ran out was the IKEA Expedit workstation. I love this desk/bookshelf combo. This is the version we purchased for Mr. One's room...it has a black/brown finish. I love the clean modern lines. And the storage...Oh, the storage! It was easy to put together with the help of the hubby. 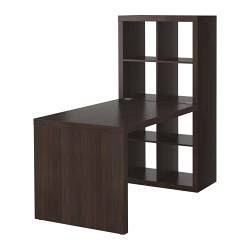 Just a hint: If you happen to put together this bookcase with your spouse, please make sure you are both in good communication mode that day. So that when you ask him to "hold it up for a minute", he doesn't hear "put it down" (because those two things sound so similar...lol) and accidentally drop said bookcase on your little toe causing a huge purple bruise that lasts a week and half. Don't worry, I've long since forgiven the Hubby for his lapse in listening skills. Really, I have.. In the meantime, I have something up my sleeve for Mr. One's room...that I plan to hang above the workstation in the interim. I love what you have done with your son's room so far! And I can't wait to see what you have planned to hang over his work area! I can't begin to guess what it is, so I will just have to come back on Friday! We have that desk/shelf combo (though with a 4 x4 shelf) in our home school room and I LOVE it. It is wonderful. I can't wait to see the full room. We bought a very inexpensive cable curtain rod thingy from Ikea that works similarly and used it in my Fine Arts major daughters studio room to hang art from curtain clips. Works like a charm. Love where your room is headed. I can't wait to see what you have up your sleeve next! The room looks great! I can't wait to see what you have up your sleeve! very nice!!! Gotta love Ikea! always love an ikea answer to a budget restricted plan!! oh aren't husbands wonderful! my husband has what I have only heard of until I met him "selective hearing" he only hears what he wants!! its quite amazing!